The scalable South Dakota map on this page shows the state's major roads and highways as well as its counties and cities, including Pierre, the capital city, and Sioux Falls, the most populous city. To display the map in full-screen mode, click or touch the full screen button. To zoom in on the South Dakota state road map, click or touch the plus (+) button; to zoom out, click or touch the minus (-) button. To scroll or pan the zoomed-in map, either (1) use the scroll bars or (2) simply swipe or drag the map in any direction. (The scrolling or panning method you use will depend on your device and browser capabilities.) At any time, you can display the entire South Dakota road map in a new window or print this page, including the visible portion of the map. South Dakota's Interstate Highways connect its major cities and facilitate travel between South Dakota and its neighboring states. I-29 crosses eastern South Dakota from north to south, while I-90 traverses the state from east to west. I-190 provides access to downtown Rapid City from I-90, while I-229 provides access to Sioux Falls from I-29 and I-90. A meandering drive from Cactus Flats to Spearfish passes through the striking Badlands National Park, which is home to craggy ridges, spires, and canyons as well as rich fossil beds and ancient cave paintings. Sage Creek Rim Road is surrounded by many diverse grasses and wildflowers, as well as bison, mule deer, and bighorn sheep. Travelers can also see the Black Hills National Forest as well as several state parks, but one of the most famous stops will be the Mount Rushmore National Monument near Keystone, showcasing the carved faces of George Washington, Thomas Jefferson, Abraham Lincoln, and Teddy Roosevelt. 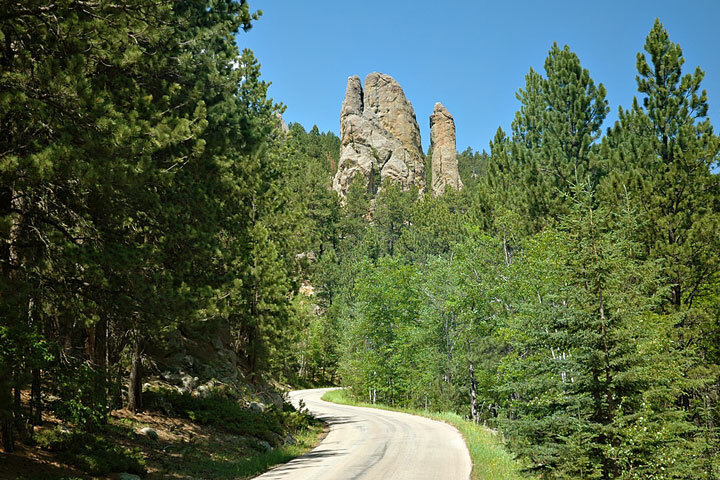 More information about scenic roads in South Dakota is available on these America's Byways: South Dakota and South Dakota Scenic Byways pages. For more information about South Dakota's roads and transportation infrastructure, visit the South Dakota Department of Transportation website. For South Dakota road traffic conditions, visit the Federal Highway Administration's South Dakota Traffic Information page.